Home » History » The Umbrella – Who invented it ? The Umbrella – Who invented it ? In Oxford Street in London there is a shop which hasn’t changed for over 180 years. James Smith & Sons says the legend over the door, in gold lettering, Ladies Umbrellas, Tropical Sunshades, Garden, & Golf Umbrellas, Life Preservers, Dagger Canes, Swordsticks. It is the oldest and biggest umbrella shop in Europe. Queen Victoria’s favourite Prime Minister, Mr Gladstone, used to buy his umbrellas from Smith & Sons. No respectable gentleman at that time would ever go out without his big, black, correctly-rolled umbrella. African chiefs visiting London would make a special trip to Smith & Sons to order huge, decorated ceremonial umbrellas for use back home. But umbrellas are much, much older than you might expect. Ancient Egyptian carvings show Pharaohs sitting on thrones beneath ceremonial umbrellas. According to Chinese legend, the umbrella was invented 3,000 years ago by a Chinese lady, but only those of royal blood or high authority were permitted to use one. The King of Burma had many titles; one was ‘Lord of the Great Parasol’, and he alone could use a white umbrella, while officials carried umbrellas of different colours according to how important they were. The Mikado of Japan never appeared in public without his umbrella bearer. When Queen Victoria’s son, the Prince of Wales, toured India in 1877, he rode on an elephant beneath a fabulous golden umbrella; as a mark of respect to their ruler’s son, Indian princes presented him with umbrellas made of blue silk looped with pearls, and embroidered brocade set with rubies. The Greeks probably introduced the umbrella into Europe 2,000 years ago. Greek ladies liked going for a walk with a slave holding an umbrella over them to keep off the sun. Roman ladies were particularly fond of purple umbrellas, and they were probably the first people to use umbrellas as protection from the rain. The umbrella kept on being rediscovered, even though the way it works has not changed much from the beginning. During the sixteenth century the Pope decided that an umbrella was a good symbol of dignity and honour, and had one carried over him whenever he appeared in public. Travellers began to notice the strange new object. 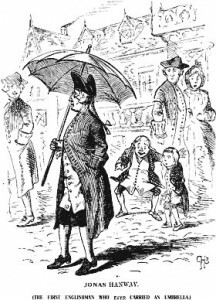 Thomas Coryate, who brought the fork back to England with him from Italy, described the Italian umbrellas. Umbrella comes from the Latin word umbra – shade, via the Italian word ombrella – little shade. Slowly the idea caught on in France, then in England. People brought umbrellas home with them from their travels in China, Italy and Spain. But, at first, carrying an umbrella was not considered the done thing. When John MacDonald took his umbrella out with him on the streets of London in 1772, cab drivers shouted after him: ‘Frenchman, Frenchman, why don’t you call a coach ?’ The cab drivers were worried that umbrellas would take away their business. That same year a shopkeeper in America bought an umbrella from a ship just back from India. He proudly took it out on the street, but, so the story goes, women were frightened, horses bolted, and children threw stones. It was probably the first umbrella in America, But by the 19th century fashionable Americans waited eagerly for shipments of the latest umbrellas and parasols from London and Paris. Elegant ladies now carried parasols of lace and beads, with silken fringes, to protect their faces from the sun. It was certainly not fashionable for ladies to have a suntan. About 1820 the design of umbrellas began to improve. Heavy, clumsy frames made of oak or cane were replaced by whalebone and, in 1851, by steel ribs. Coverings changed from sticky oiled silk or linen to cotton, alpaca and, much later, nylon. When English manufacturers first began making umbrellas at the end of the eighteenth century, they often hung little acorns on the handles. It was an old superstition. Acorns were meant to protect against lightning, because the oak-tree was sacred to the God of Thunder. Over in America, Benjamin Franklin had done some important research on lightning, and had invented the lightning conductor. The Frenchman who translated Franklin’s book into French was so frightened of lightning that he attached a miniature lightning conductor to the top of his umbrella. He appeared in the streets of Paris in 1786, a wire dangling from his umbrella to the earth, trailing along behind him as he walked.